I have already shared the North Indian style of Broccoli Aloo Masala recipe in my blog. This Broccoli potato masala is entirely different from that one both in looks as well as taste. This one is a bit mild and less spicy. The north Indian style preparation is a tomato based spicy preparation. You could prepare that north Indian style filling too for this dosa, but that's is purely your choice. Today I have come up with a south Indian style of Broccli and potato masala to serve with dosa. You could serve masala with chapatis, pooris, dosa..etc. 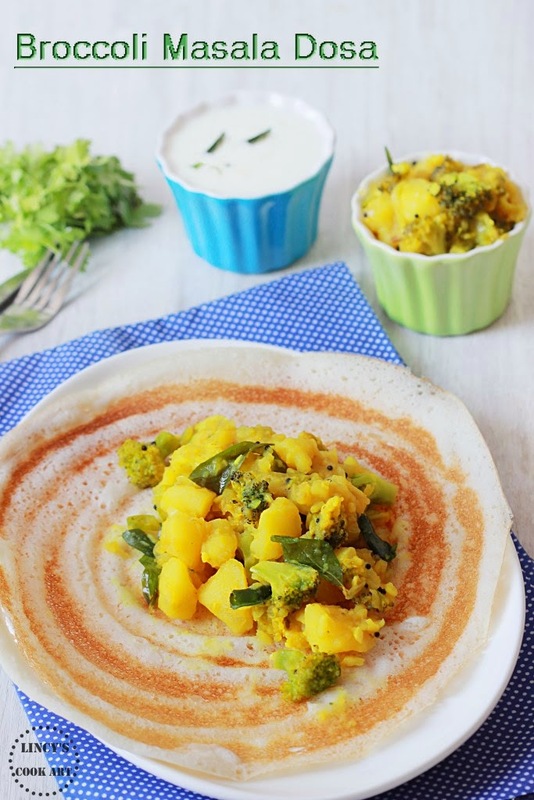 I have given a healthy twist to the South Indian Potato masala by adding the healthy ingredient, the broccoli. Pressure cook the potatoes till soft for about 4 whistles. Peel and cut the potatoes into bite sized pieces. Wash and cut the broccoli in to medium sized pieces. Heat oil in a pan and add the mustard seeds and urad dhal. Once the mustard seeds splutters add the curry leaves and fry for a second. Now add the chopped onion and green chillies and cook for fifteen seconds. Add the finely chopped ginger and garlic and saute for fifteen seconds. Add the broccoli and saute for thirty seconds. Now add the potatoes and turmeric powder, salt and about 1 and half cup of water. Allow the mixture to boil well and cook till the broccoli florets becomes slightly soft and the potato starts to become mushy. Cook according to your palatte. Because some likes to have pieces of potatoes in the masala some like it like mashed consistency and switch off the gas. Heat dosa tawa and grease with oil; add a ladle full of batter and spread with the ladle into concentric circles. Drizzle half a teaspoon of oil;once the batter starts to cook add big scoop of broccoli potato masala over the dosa and roast the dosa till crispy. Fold the dosa as per your desired shape triangle or fold into half.